Read Genesis 3:8–20. What does God do before He pronounces judgment? The concept of an investigative judgment is biblical. God’s judicial procedure often includes a phase of investigation and inquiry. A first instance is reported in Genesis 3 , where God investigates before He pronounces the verdict (Gen. 3:8–19). God’s dealings with Cain ( Genesis 4 ), Babel ( Genesis 11 ), and Sodom ( Genesis 18, 19 ) follow a similar pattern. We see God undertaking the same action that He requires of the judges in Israel; namely, to “investigate and search out and inquire thoroughly” (Deut. 13:14, NASB; see also Deut. 19:18). Investigation involves deliberation and fairness. It is often public. God allows others to see for themselves what He is doing. In this way, when God announces the verdict—be it salvation or condemnation—onlookers are assured that God’s action is the best. This is exactly the reason why the heavenly judgment in Daniel 7 involves books. The books are not for God’s sake, so that He would remember more easily, but for the benefit of the celestial beings surrounding Him, who, unlike God, don’t know all things. How does judgment turn out for the saints? Dan. 7:22. In talking about the judgment, Ellen G. White wrote: “The fact that the acknowledged people of God are represented as standing before the Lord in filthy garments should lead to humility and deep searching of heart on the part of all who profess His name. Those who are indeed purifying their souls by obeying the truth will have a most humble opinion of themselves. . . . But while we should realize our sinful condition, we are to rely upon Christ as our righteousness, our sanctification, and our redemption. We cannot answer the charges of Satan against us. Christ alone can make an effectual plea in our behalf. He is able to silence the accuser with arguments founded not upon our merits, but on His own.”—Ellen G. White, Testimonies for the Church, vol. 5, pp. 471, 472. How do these words help us to understand why the judgment is such good news? I love the Ellen G. White quote on Monday! It reminds us that in Christ alone lies our Salvation even during judgment when we cannot even defend ourselves from satan's accusations. The judgment is good news because God is Love, and all comes out fairly with Him in charge. He does not want negative consequences for any person, so he has made a Way through Jesus for everyone to be covered. All that is necessary is that we accept His Way and plan and let Him cover us. The judgment means that God will finally be able to give us the rewards of all He has done for us, and we will inherit His kingdom. Judgment is a good news at the same time a warning for us to be sincere in our Christian life. The groups in Matt. 7:21-23 and Rev.3: 15-17 are people who are "in Christ" but they faced rejection from the Savior. So it's very important that we know the correct meaning of being in Christ so that the judgment will not be against us. Remember judgment has always two sides, vindication and punishment. It's hope and encouragement to me to understand God's judgment. The Lord isn't arbitrary. Yes, there is a judgment, we will be judged as either good or evil and yes there are consequences for each. What's encouraging is the fact that as I belong to Him, by surrender as evidenced by personal choices that He gives me strength to make daily, He's on my side. Like Joshua, God calls for a clean garment to be placed on me, covering my filthiness. Zechariah 3:3-7 Now Joshua was dressed in filthy clothes as he stood before the angel. The angel said to those who were standing before him, “Take off his filthy clothes.” Then he said to Joshua, “See, I have taken away your sin, and I will put fine garments on you.” Then I said, “Put a clean turban on his head.” So they put a clean turban on his head and clothed him, while the angel of the Lord stood by. 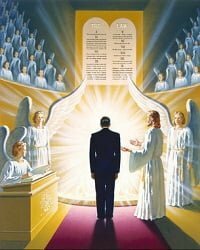 The angel of the Lord gave this charge to Joshua: “This is what the Lord Almighty says: ‘If you will walk in obedience to me and keep my requirements, then you will govern my house and have charge of my courts, and I will give you a place among these standing here. There are no false accusations, bribed witnesses, lies or misrepresentations entertained in God's judgment hall, Jesus' blood covers my failures - ALL OF THEM! He covers me with His righteousness and then gives me a place of belonging with Him. If this is a picture of God's judgment for humans, and it is, I pray that I would constantly trust His righteousness that covers me. Every time i am reminded about the fact that Jesus is mediating on our behalf my mind goes back to the scripture in Zachariah 3, where the angel of the Lord stands us to Satan on be half of Joshua. And I put myself in the story, believing and knowing that He (Jesus) will do the same for me, once I remain faithful to Him. When I am judged, I know that I will be accused of a lot of things and they all will be true. I come to really understand that statement, everything that the accuser will accuse you and me of will all be true. We all have sinned and fall short and standing in Judgment with my raggedy cloths on listening to someone tell everybody all my thoughts and faults, it will be humbling BUT I am glad that my Lawyer is bought and paid for and he is there to help and save me. What a wonderful Christ I have...I love him. Judgment day a frightening thought for those who have deliberately transgressed the law and love of God, but a good tidings for those who have overcome and have been victorious over all the satanic warfare against them. God's plans for mankind are to far away for a men to comprehend. His ways are always right and therefore his judgment. Whenever I come across this word judgement and studying it out, I see how nearer the judgement of God is.indeed is a challenge for us to prepare ourselves for the judgement day.very surprising is that everything will be open. He will never hide anything from us because it's written down,our daily deeds. Here is an encouraging quote from the book "Great Controversy". I am such sinner, I need your prayers fellow Christians. I don't want to perish. Oh what peace, peace, wonderful peace! Jesus to gain and nothing to lose! Amen and amen!! Worthy to be praised for ever is our Creator, Redeemer and Judge!